If you’re over ingesting animal products and serious about maximizing muscle tone, there’s good news in a recent study that showed – for the very first time - that plant-based rice protein is equal to animal-based whey for building and repairing muscle. A double blind study published in the June 2013 issue of the Nutrition Journal was done at the University of Tampa where sports nutrition researchers compared rice and whey protein with subjects who were building muscle and looking to reduce soreness quickly so they can return to training. “The results were identical using a rice protein called Oryzatein™ manufactured by Axiom Foods,” said one of the study researchers, Dr. Ralf Jager. 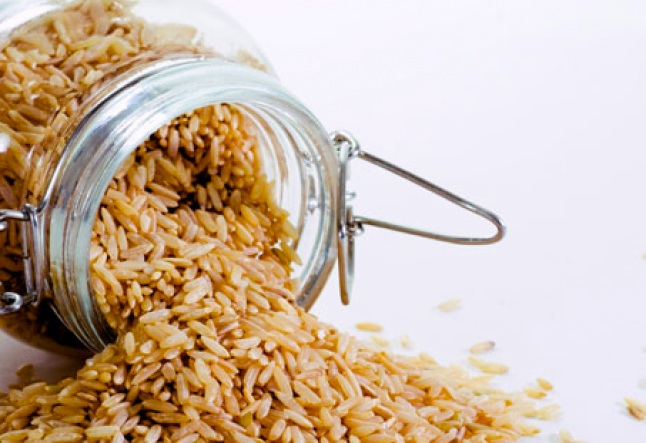 “For years, rice protein was always assumed to be inferior to whey, so this study is a big deal,” said Kay Abadee of Growing Naturals, a rice protein company that uses Oryzatein™ in their products. A massive forward stretch in food technology, rice is quickly becoming the biggest food replacement for gluten-laden wheat and GMO-infested corn. The best news: rice is the world’s #3 crop and there’s plenty of it to not only feed the yogaphile population, but could provide a karma yogic dent in helping world hunger issues. “All natural food products are not created equal,” said David Janow, co-founder of the World Rice Alliance a rice purity watchdog organization, “Oryzatein is made with a 100% enzyme extraction process – most companies use the highly noxious petroleum product hexane to pull the parts of the rice apart. That’s not very natural.” With recent news about heavy metals in rice, food purists needn’t be worried about contamination from the rice used to make Oryzatein™ ingredients, grown in the United States, northern China and Thailand. Until now whey protein has been the gold standard of the fitness industry, but the fact that a real plant-based alternative exists is just a small piece of the significance. Today, intolerance to lactose affects nearly 70% of the world’s population. Hormones used in cow farming are passed on in larger concentrations through dairy products than through cow meat. We’ve heard how hormones in cow milk are affecting early puberty. Soy protein is losing popularity after learning about phytoestrogens. So, in a nutshell, we’re glad to see that an allergen-friendly plant-based protein is here to stay. Soon you will be able to look for the “Powered by Orzyatein” label on rice protein packaging in your local health food store.